GU MANHOLE BASE LINER rules out several possible sources of errors in manhole base production insuring layout right from the start. 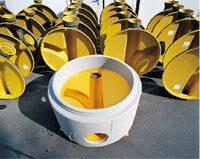 The design makes manhole base production and installation easier than conventional products. The monolithic structure of the manhole base and efficient liner bonding provide a finished product that will last decades. Cast "upside down" on a support cone with monolithically poured concrete around. Back side with exposed angular aggregate and wire coils for a strong mechanical bond to concrete. The monolithic construction makes application easy & safe. Because the GU lined manhole base is formed upside down, no reworking is required. This means quick and safe production with attractive cost savings. Conventional manhole bases, especially those with inferior mortar quality benching, are subject to attack from aggressive waste water and will require expensive repair work. 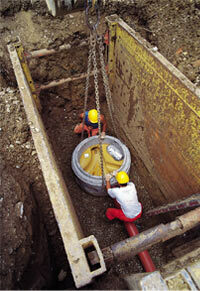 With GU lined manhole bases such problems are a thing of the past.